Bentley loves to relax in the autumn sun. Pierre thinks rolling in the autumn leaves is more fun. Yep, the girls love to roll in the grass! Haha! I luv da sun AND da leaves! I'm a sun bathing girl at our house. Actually, Bailie and I both love to roast our furs in the sunshine! Pierre, what is wrong with you not lying in the sun? And you both look adorable! BOL...we canNOT stop laughing! The first thing we "saw" was Pierre covered in leaves and it reminds us of me! I always have leaves and flowers stuck in my fur. Oh, how funny. What a great fun picture. Finally going to get a chance to catch up today. Missed everyone. My huskies like to do a bit of both haha! Gorgeous photo! Pierre looks like he's contemplating life. We love the sun and unfortunately Mabel loves to eat the leaves! 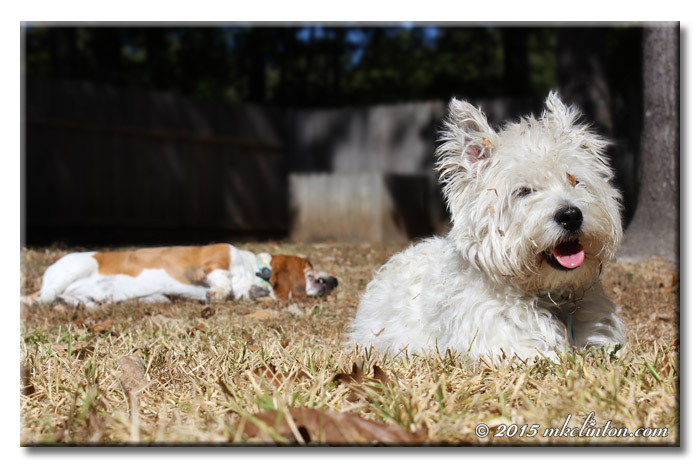 Bilbo and I are all about finding a good sun puddle, while Arty and Jakey would rather do zoomies through the yard! Kilo loves both, although he doesn't trust big piles of leaves- what a cute pic. Between the two of them, they have the joys of the fall season covered! Great shot!! That captures your pair perfectly! Nicely done. You both look to be enjoying the fall. Great photo! Wow, I totally agree with BOTH of you! I also like to walk along and crunch the leaves under my paws and shuffle them around. BOL Great pix of you! They are both good activities - um one being more active than the other . . . sort of! I love lying in the autumn sun, too! It is extra special as I know it won't be long before it is too cold to do it! So cute! No leaves in our yard. Poor Rita. So deprived! We'd love to roll in the leaves! As long as it is in the sun it does not matter if you roll,relax, or a little bit of both. Your dogs looks so cool and relaxed. We are still waiting for Autumn to arrive here in the desert. For now I'll just have to enjoy other people's pictures of falling leaves and cooler days. Such a great photo! Love it! Autumn is my favorite time of year! I don't have a dog, but my cat loves sun puddles. I love your picture - Autumn colors are amazing for taking pictures! There's something for everyone to love about autumn, isn't there? Our crew enjoys the cooler weather, they seem more energetic at times and just love being outdoors.